Ewing Young was well represented by seven students at the district’s annual 24 math competition. Fourth graders Jonas, Norris, and Ty along with fifth graders, Emily, Gracie, Grant, and Ronak, joined over 80 other students from around the district. All students had to use their quick mental math skills to make four digits total 24. Ty, Emily, Grant, & Ronak all qualified for the quarter-finals, with Ty, Emily, and Ronak advancing to the semi-finals. Special congratulations go to Ty and Emily for placing 2nd in their respective grade levels! Congratulations to Rylan, John, and Lucas. 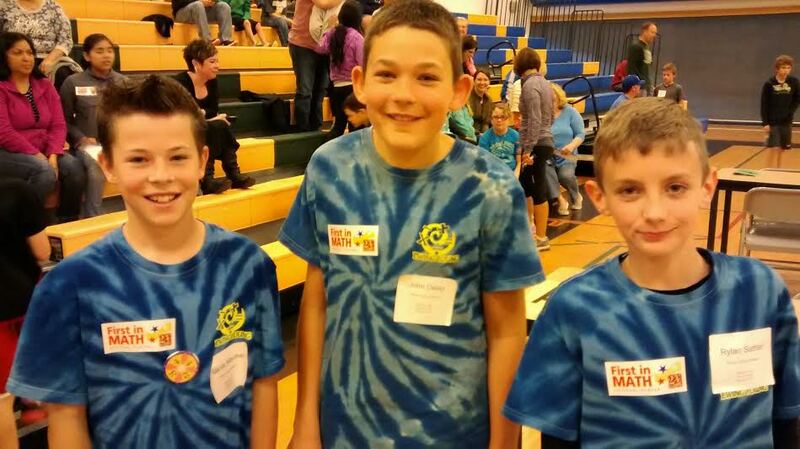 They placed 1st, 3rd, and 4th place respectively in the 5th grade category of the District 24 competition. Way to represent EY! Then the top 4 at each grade level competed for the championship. Congratulations to 2nd place finisher Rylan Sattler! As always, the EY students showed good sportsmanship at all times and supported their teammates as they advanced. Andy Byerley made a special effort to compliment the EY students’ sportsmanship to me after the event. Way to go EY Mathletes! A big “Thank you” to Mr. Milner & Mrs. Mitchell for their work on shirts for the team.